Namibia: Windhoek to introduce a new "shopping bus route"! Namibia's capital Windhoek is set to introduce a new shopping bus route between the Woman Centre (Okuryangava) and Wernhill Park with access to Windhoek's city centre. This dedicated shopping bus service will be available every Saturday from 10:00 to 16:00 departing every hour. One trip will cost 6 NAD cash (or 5 NAD via Smart Card) and will last 37 Minutes. For more info on the bus stops, click here! South African Airways to reduce flights between Johannesburg <> São Paulo! South Africa's flag carrier, South African Airways, will reduce the number of flights between OR Tambo International Airport (JNB) in Johannesburg and São Paulo/Guarulhos–Governador André Franco Montoro International Airport (GRU) in São Paulo. From 28 April 2017, the airline will operate 7 weekly flights instead of the current 10 weekly flights on the route. South African Airways has increased capacity between Johannesburg <> Victoria Falls! South African Airways has increased capacity between OR Tambo International Airport (JNB) in Johannesburg and Victoria Falls International Airport (VFA) in Victoria Falls by operating a wide-body aircraft on the route. Instead of the previously used 138-seater Airbus A320, the airline now operates flights to Victoria Falls and back on board a 222-seater Airbus A330-200. Ethiopian Airlines & South African Airways to expand their codeshare agreement! Ethiopia's flag carrier, Ethiopian Airlines, and the flag carrier of South Africa, South African Airways, have entered into an expanded codeshare agreement. The agreement was inked on 01 October 2016 and is projected to be effective as of the 2017 summer season. The revamped codeshare agreement is anticipated to further enhance the cooperation among the two carriers, both members of the Star Alliance, and avail a range of additional destinations for customers to travel to. Ethiopian Airlines and South African Airways signed the first codeshare agreement on 17 September 2003. The extended codeshare agreement will include destinations such as Cape Town, Durban and Toronto. More codeshare destinations will be added in the near future. We'll keep you posted! South Africa: South African National Institute for Communicable Diseases (NICD) issued official malaria advisory! South Africa is currently experiencing its annunal malaria season, which usually occurs during the rainy months between September and May. The South African National Institute for Communicable Diseases (NICD) has therefore issued an official malaria advisory to remind travellers visiting any of the malaria areas within or outside of South Africa to take additional precautions and maintain a higher index of suspicion. The NICD (National Institute for Communicable Diseases) is a division of the NHLS (National Health Laboratory Service). Namibia to switch back to "winter time" in April 2017! update (29 March 2017): I Love Swakopmund just posted on its facebook page that the office of the Erongo Regional Council has confirmed the winter time change to take place on 02 April 2017. Namibia might currently be discussing the abolition of winter time (UTC+1), but as long as the Namibia Time Act of 1994, through which winter time was introduced in Namibia, is not getting replaced by the Namibia Time Act of 2017, which will see the implementation of a countrywide single standard time (UTC+2; summer time), time in Namibia will change from summer time to winter time on 02 April 2017. The official time change will take place at 02:00am (from 02:00am to 01:00am). In case everything remains as it is in Namibia, time will change back to summer time on the first Sunday in September 2017 (03 September 2017). Time does not change in the Zambezi Region (until 2013 known as the Caprivi Region) in Namibia's north, as this area is not subject to summer and winter time changes. Airlink to increase flights between Nelspruit <> Vilanculos! South African carrier Airlink is set to increase flights between Kruger Mpumalanga International Airport (MQP), located about 60km north east of Nelspruit, and Vilanculos Airport (VNX) in Vilanculos. The airline currently operates flights on Thursdays and Sundays. Kgalagadi Transfrontier Park: Unleaded fuel currently not available at Twee Rivieren Rest Camp! South African National Parks (SANParks) announced today (24 March 2016) that unleaded fuel is currently not available at the Twee Rivieren Rest Camp in the Kgalagadi Transfrontier Park. The fuel pumps, which have been problematic since their upgrade in 2016, have stopped working completely and will be out of order indefinitely. The diesel pump at Twee Rivieren Rest Camp is still in working condition. Fuel pumps at the Nossob Rest Camp and Mata Mata Rest Camp are also still in order. The fuel supplier Total is yet to upgrade these fuel stations. 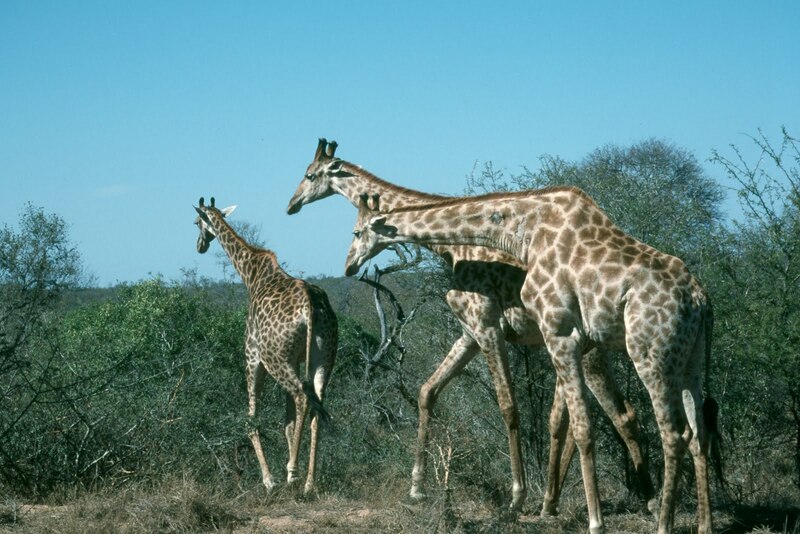 South African National Parks (SANParks) advises visitors to fill up at Askham, a village located about 200 km north of Upington at the junction of the R31 and the R360 roads, before entering the Park from the South African side, or at Nossob Rest Camp and Mata Mata Rest Camp in the Kgalagadi Transfrontier Park. Air Namibia to increase capacity on flights between Windhoek <> Gaborone <> Durban! Namibia's flag carrier, Air Namibia, will increase capacity on it's flights between Hosea Kutako International Airport (WDH) in Windhoek and King Shaka International Airport (DUR) in Durban via Sir Seretse Khama International Airport (GBE) in Gaborone. Effective 26 March 2017, the airline will operate an Airbus A319-100 with 112 seats instead of a 37-seat Embraer ERJ 145 on the route. Air Namibia connects Windhoek, Gaborone and Durban with four weekly flights on Mondays, Wednesdays, Fridays and Sundays. Rwanda: Rwandair to launch direct flights to London in May 2017! update (20 April 2017): Rwandair will operate flights to Gatwick Airport (LGW) in London on Tuesdays, Thursdays and Fridays. update (29 March 2017): Rwandair will operate three weekly flights (!) between Kigali and London's Gatwick Airport (LGW) on board the newly acquired state of the art Airbus A330 fleet in a triple class configuration with inflight connectivity. Rwanda's flag carrier, Rwandair, is set to launch scheduled direct flights to London in the UK on 26 May 2017. The airline will operate four weekly flights on Tuesdays, Wednesdays, Thursdays and Fridays onboard an Airbus A330-200 carrier in a three-class configuration between Kigali International Airport (KGL) in Kigali and Gatwick Airport (LGW) in London. Kruger National Park: Letaba Elephant Hall has been reopened! The well-known Letaba Elephant Hall at Letaba Rest Camp in the Kruger National Park (KNP), which was closed for renovation since mid-January 2017, has been reopened for tourists on 20 March 2017. The renovation works at the environmental education centre included the installation of newly designed display panels and a new lighting system as well as new flooring, new cabinets and landscaping. The desk which service staff members operate from when guests enter the facility has also received a face lift. Eurowings to launch flights between Cologne Bonn Airport <> Cape Town! German low-cost airline Eurowings, a fully owned subsidiary of the Lufthansa Group, is set to launch a seasonal service to South Africa. Effective 05 November 2017, the airline will operate one weekly flight between Cologne Bonn Airport (CGN), which serves the cities of Cologne and Bonn in Western Germany, and Cape Town International Airport (CPT) in Cape Town. The seasonal service will end on 19 (26?) March 2017. Air France to increase flights to South Africa! The flag carrier of France, Air France, is set to expand it's operations between Charles de Gaulle Airport (CDG) in Paris and both OR Tambo International Airport (JNB) in Johannesburg and Cape Town International Airport (CPT) in Cape Town from 29 October 2017. The airline will increase it's flights to Johannesburg to a daily service operated by a Airbus A380, while it's flights to Cape Town will increase from currently 3 flights per week to 5 flights per week. According to the permanent secretary in Botswana's Ministry of Health and Wellness, Shenaaz el-Halabi, 672 new cases of malaria have been recorded in the country subsequent to the recent downpours, 60% of which were registered in the Okavango area (as of 15 March 2017). The government of Kenya has banned the import, use and manufacture of plastic bags used for commercial and household packaging. The ban, which was made public by the country's Cabinet Secretary for the Environment and Natural Resources Prof. Judi W. Wakhungu on 15 March 2017, will become effective on 28 August 2017.
carrier bags - "constructed with handles, and with or without gussets"
flat bags - "constructed without handles, and with or without gussets"
Cape Town: Free access to Table Bay Nature Reserve on 18 & 19 March 2017! The Table Bay Nature Reserve, an 880-hectare nature reserve in Milnerton (Cape Town), is hosting an open weekend from 18 to 19 March 2017. Visitors will have free access to the reserve, which consists of several smaller constituent reserves, including the Rietvlei Wetland Reserve, Diep River Fynbos Corridor, Zoarvlei Wetlands, Milnerton Racecourse Nature Reserve and Milnerton Lagoon, and is home to to about 412 plant species, 31 species of mammal, 196 bird species, 33 reptile species, 9 species of amphibian, and 14 fish species. The open weekend at the Table Bay Nature Reserve coincides with Milnerton Aquatic Club's 24-hour endurance sailing challenge at the Rietvlei Water Area. Due to the event, visitors to the nature reserve will not be permitted to practise water sports within the recreational water on the 18 and 19 March 2017. Due to limited parking, spectators and visitors are encouraged to use public transport or arrive on foot. There are several MyCiTi bus stops along Blaauwberg Road that are about a kilometre from the main entrance. 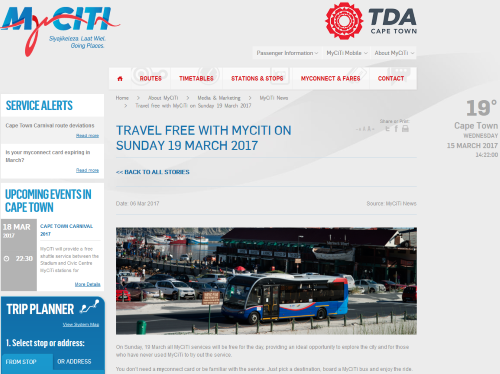 Cape Town: Travel free with MyCiti on 19 March 2017! MyCiTi, the high-quality bus-based transit system in Cape Town, offers free transport on all routes all day long on 19 March 2017. Passengers do not need a myconnect card to travel on the bus on this day and they can make as many trips as they wish, on any bus and on any route for as long as the service is operational. Cape Town International Airport (CPT) in Cape Town was named Best Airport in Africa at the 2017 SKYTRAX World Airport Awards™. Durban's King Shaka International Airport (DUR) came in second in the continental category, followed by OR Tambo International Airport (JNB) in Johannesburg. East London Airport (ELS) in East London was voted 6th best airport in Africa, Bole International Airport (ADD) in Addis Ababa was named 7th and Port Elizabeth International Airport (PLZ) in Port Elizabeth 10th best on the continent. King Shaka International Airport (DUR) in Durban won the award for Best Regional Airport in Africa (6th in global ranking! ), followed by East London Airport (ELS), Port Elizabeth International Airport (PLZ) and Bram Fischer International Airport (BFN) in Bloomfontein. Kigali International Airport (KGL) in Rwanda's capital Kigali was voted 5th best regional Airport in Africa and Windhoek's Hosea Kutako International Airport (WDH) was voted 6th best African regional airport. King Shaka International Airport (DUR) not only scooped the award for Best Regional Airport in Africa, but also for Best Airport Staff in Africa. Cape Town International Airport (CPT) was named second best, OR Tambo International Airport (JNB) came in on 4th and East London Airport (ELS) on 5th. Hosea Kutako International Airport (7th), Port Elizabeth International Airport (9th) and Jomo Kenyatta International Airport (10th) in Nairobi also made it into the Top 10 of the airports with the best staff in Africa 2017. Congtratulation! The 2017 SKYTRAX World Airport Awards™ are based on 13.82 million survey questionnaires completed by 105 different nationalities of airline customers during the survey period which operated from July 2016 to February 2017. The survey covers 550 airports worldwide and evaluates traveller experiences across different airport service and product key performance indicators - from check-in, arrivals, transfers, shopping, security and immigration through to departure at the gate. South Africa: Durban will not host the Commonwealth Games in 2022! Durban in South Africa has lost the rights to host the Commonwealth Games in 2022. According to a statement by the Commonwealth Games Federation (CGF), a "detailed review has concluded that there is a significant departure from the undertakings provided in Durban's bid and as a result a number of key obligations and commitments in areas such as governance, venues, funding and risk management/assurance have not been met under the revised proposition." Reuters reports that the English cities of Birmingham and Liverpool have expressed interest to replace Durban as the host city of the Commonwealth Games 2022. Cape Town Tourism has released a new episode of the "The Love Cape Town Neighbourhood series" featuring Durbanville, a suburb located in the northern outskirts of Cape Town. Previous episodes include Kalk Bay, Cape Town CBD, Woodstock, Constantia, Somerset West, Langa and Khayelitsha. "The Love Cape Town Neighbourhood series" was launched by Cape Town Tourism in 2015 to promote and highlight Cape Town's diverse suburbs. The first three episodes were released in September 2015, another three in March 2016 , the seventh episode on 15 January 2017 and the eigth episode on 07 March 2017. South Africa & Russia: Visa-free regime from 01 April 2017! update (30 March 2017): According to a tweet by the Government of South Africa, the new visa regime comes into effect from 01 April 2017. South Africa and Russia have agreed on a mutual visa free regime that comes into effect on 30 March 2017. Russians travelling for leisure to South Africa will be free from visa requirements and can enter, stay or transit without a visa for a duration of up to 90 days; the same goes for travellers from South Africa visiting Russia. Air Namibia & Condor signed a codeshare agreement! Namibia's flag carrier, Air Namibia, and German airline Condor have signed a codeshare agreement. Subject to the approval of the German Civil Aviation Authority and the Namibia Civil Aviation Authority, the codeshare agreement is expected to begin with the 2017 summer flight schedule. Under the agreement, Condor passengers will have access to Air Namibia's daily flight connections between Windhoek <> Frankfurt and Air Namibia's passengers to Condor's twice-weekly flights between Frankfurt <> Windhoek (Mondays and Fridays). This means that passengers of the two airlines can choose from nine weekly connections during the summer flight plan and from seven weekly connections in the upcoming winter. In addition, Air Namibia and Condor will also offer other complementary connections of the partner airline. Condor's "DE"-code will appear on flights to eight destinations in Air Namibia's network in Southern Africa, while Air Namibia's "SW"-code will be on many additional Condor destinations, such as Minneapolis, Seattle, Austin and Barbados. Surf video: "Inside the Legendary Barrels of Namibia"
Surfers out there, this is for you! GoPro has teamed up with professional surfers Koa & Alex Smith, Koa Rothman, Benji Brand and Anthony Walsh to shoot this outstanding video about the legendary barrels of Namibia. Sit back and enjoy! Qatar Airways will increase flights between Doha <> Windhoek! According to aviation specialists routesonline, Qatar Airways is set to increase its flights between Hamad International Airport (DOH) in Doha and Hosea Kutako International Airport (WDH) in Windhoek. Effective 02 July 2017, the airline will operate seven weekly flights instead of the current four weekly flights on the route. Qatar Airways will also change the type of aircraft on the Doha <> Windhoek route. Effective 27 March 2017, the Boeing 787-8 will be replaced by an Airbus A333-200. Heavy rains: Temporary closure of roads in the Kruger National Park! South African National Parks (SANParks) has temporarily closed some roads and gravel roads in Kruger National Park due to heavy rains. All roads which are closed are marked with "No Entry" signs or blocked with other objects. People should refrain from opening and driving on these roads as closures are necessary to ensure their safety. The H1-2 tar road from Skukuza Rest Camp to Tshokwane Picnic Side, (Manzimahle Creek) is closed. The closure is due to a damaged bridge after the recent heavy rains. Visitors are advised to use H10, the Lower Sabie low water bridge as an alternative until further notice. Gravel roads that are closed in the Marula Region are H2-2, S30 and S79. The S63 gravel road is closed. Tanzania: Precision Air to relaunch flights to Entebbe (Uganda)! Tanzania's leading domestic airline, Precision Air, is set to relaunch flights between Julius Nyerere International Airport (DAR) in Dar es Salaam and Entebbe International Airport (EBB) in Entebbe in Uganda on 01 July 2017. The airline plans to operate four flights per week with two nonstop flights from Dar es Salaam to Entebbe and two services routing via Kilimanjaro International Airport (JRO)*. Tickets sale is expected to commence on 10 March 2017. Precision Air suspended flights to Entebbe back in 2013. * Kilimanjaro International Airport (JRO) serves the cities of Arusha and Moshi. South Africa's most punctual domestic airlines in February 2017! Airports Company South Africa (ACSA) has published the on-time performance results of domestic airlines’ flying out of OR Tambo International Airport (JNB) in Johannesburg, Cape Town International Airport (CPT) in Cape Town and Durban's King Shaka International Airport (DUR) in February 2017.